In the first three months of 2013, the strategy game Xploding Boxes was downloaded by BlackBerry PlayBook users in 142 different countries. 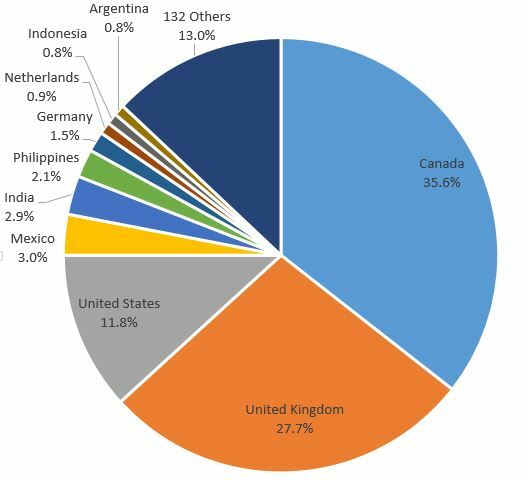 As in the past most users are from Canada, the United Kingdom, and the United States. The biggest change from three months ago, is the increase in UK users, which is now up to 27.7% of PlayBook users. However, for the most part the distribution of countries being represented is very consistent with what it previously has been. These statistics are generated from PlayBook downloads of the popular strategy game Xploding Boxes, from January 1st, through March 31st. Data was collected by BlackBerry World at the time of download.